The Evil Within did not make a good first impression on me. I started the game on PS4 near the time of its release, played maybe three or four hours, decided I wasn’t having fun with the gruelling experience, and I sold it off. Years later, The Evil Within II came out to generally favorable impressions, and I thought I might give the series another try. But, I often get OCD around playing a series in order, and the first game was really cheap on Steam. What ultimately pushed me over into giving The Evil Within another shot was some encouraging words here on the WordPress community and elsewhere that gave favorable, if not reasonably measured, praise to the game. And I’m glad I gave the game another chance, as I found I enjoyed TEW after getting past the hump that I got stuck on earlier, and I feel good having seen it to the end. The game is a giant mess, of course, but it’s a mess that leaves a strange and surprising impression. The Evil Within begins with Krimson City detectives Sebastian Castellanos (the protagonist), Joseph Oda, and Juli Kidman responding to an emergency at Beacon Mental Hospital. The lobby of the hospital has been the site of a massacre, and Sebastian is subdued by a strange assailant in a white robe. He wakes up chained deep in the bowels of the facility, the captive of a large blood-soaked man who has other corpses strung from the ceiling and looks to be cannibalizing his victims. Defenseless, Sebastian manages to evade and escape from his captor, but not before the hospital reveals itself to be filled with gruesome mechanisms designed to slaughter those attempting to flee. In the courtyard, he meets up with Oda and Kidman, and the group finds an ambulance to make their exit. As they race through the city, an immense earthquake strikes. Massive fissures open up in the ground, and buildings begin to tumble down. They narrowly avoid being consumed by the cataclysm that destroys the city, only to fly off the edge of a cliff when their driver loses control of the vehicle. After the crash, Sebastian wakes up alone in the dark countryside. With his colleagues having abandoned him and the overturned ambulance, he begins his long journey to survive the complete breakdown of reality itself. That long and ridiculous last paragraph perfectly encapsulates the experience of The Evil Within. I feel exhausted just having written it. The game simply never settles down. I don’t think there is ever a moment when I thought to myself “I understand where this is going.” Settings are constantly being shifted, enemies are constantly changing, the story picks up in one direction only to abruptly change course. There’s never any moment of comfort to be found. There is never any expectation that will not be subverted. There are many types of horror games that are distinguished both by theme and mechanics, and what makes The Evil Within incredible is that it basically tries to do everything a horror game can do. It manages to find a way to merge psychological horror (e.g., Silent Hill), supernatural elements (e.g., Fatal Frame), and science fiction elements (e.g., Resident Evil). Superficially, it is a game that focuses on action and shooting (like Resident Evil 4 or Dead Space), but it also attempts to prominently include stealth (like The Last of Us), run-and-hide sequences (like Amnesia), and survival and resource management mechanics (like the original Resident Evil). By trying to fuse together all of these different approaches to making a horror game, The Evil Within is at its best highly admirably for ambition, but also many times manages to go over the edge and collapse into a clumsy or confusing mess. In his quest to figure out just what the hell is really going on, Sebastian Castellanos treks across a post-apocalyptic cityscape, an evil mansion, a depraved hospital, an infested sewer, dreamcapes carved out of nightmare, and essentially almost every other popular staple of the horror genre. Each of the different environments absolutely nails the aesthetics of its chosen subject and feature expertly designed atmosphere, mood, tension, and foreboding. The Evil Within never lets the player forget they are in a horror story. And despite each setting being radically different, they all feel as if they are a part of the same gruesome world. There is a distinctive aesthetic style to The Evil Within that it manages to maintain across the entirety of its expansive journey. Principally, The Evil Within is the successor to Resident Evil 4, the prime connection between the two being legendary director Shinji Mikami. As such, the action focused parts of the game tend to dominate over everything else, which is to say that the player spends a lot of time shooting at pseudo-zombies and other warped creatures. Another important feature of the game are the stealth kills, whereby the player can sneak up directly behind an enemy and execute a sneak attack that results in an instant kill. I found this to be a fairly important element of the game considering that ammo is relatively scarce, and I also just personally enjoy games that let me sneak up on enemies like this. But aside from these key components, the game introduces a ton of other mechanics. Some of them work really well. For instance, levels are wired with inconspicuous booby traps that can do a lot of damage to Sebastian if triggered. However, if the player is cautious enough and manages to dismantle these traps, they turn into spare parts which can be used to craft bolts for Sebastian’s crossbow. There are a handful of different types of bolts that deal different types of damage (for instance, proximity explosives, freeze bolts, etc. ), so the player is offered the choice of determining the best way to spend the spare parts. My favorite aspect of the game, which I’ve never seen any other horror game do, are the matchbooks that Sebastian uses to set enemies on the ground on fire. So, for instance, if Sebastian knocks an enemy to the ground, he can light them on fire with one of the matches for an instant kill. If there are other enemies standing in close proximity to the burning hostile, they will also catch on fire and suffer the insta-kill. This also applies to corpses on the ground, which creates a fun strategy where Sebastian can lure enemies over to a defeated corpse which can then be set ablaze to chain together several standing enemies with the ensuing flames. However for every good idea The Evil Within puts together, there seems to be at least one bad one. I thought one of the dumbest mechanics of the game were the hiding spots which presumably were meant to conceal Sebastian from enemies. Sebastian can hide under beds, under cars, in closets, etc., but enemies always seem to be able to find him in these spots. There is this one unkillable enemy that chases Sebastian through a mansion, and when I encountered him, I put some distance between him and I, rounded a few corners, and then went into a room and hid in a closet. About fifteen seconds later, the thing chasing me walked in, went directly to the closet, opened it, and insta-killed Sebastian. I looked up the best way to escape from this enemy, and most of the recommendations I saw told me to just circle strafe around him until he disappears. What even is the point of the hiding spots then? And this wasn’t an isolated incident. Each time I tried to make use of the hiding spots, the results were more or less the same: they do nothing to keep Sebastian out of sight. One of the real highlights of The Evil Within were the boss monsters that the game is really good at building up. The bosses are all really well designed and creatively distinct from an aesthetic standpoint. The boss fights themselves tend to be more creative than simply requiring Sebastian to unload ammo into the creatures. Usually, they require the player to make use of aspects of the environment, almost like a puzzle. This tends to lead to a trial-and-error cycle, which can be frustrating at first, but I also felt was very rewarding once I was finally able to nail it. While there are a few boss encounters that just felt clumsy and confusing, on the whole, I thought these enemies were one of the high points of the game. Sebastian’s journey took me approximately 16 hours to complete which seems to be typical going by howlongtobeat.com. That’s a huge amount of time for a linear action game like The Evil Within, and the entire quest definitely felt epic as a result. This is in spite of the story being largely meandering and insubstantial for the first three quarters or so of the game. Sebastian’s warped reality is constantly shifting, and at any given moment he can be teleported to a completely different setting with seemingly no rhyme or reason behind it. This results in plot threads being constantly interrupted with no resolution until the very end. In one moment, Sebastian will be trying to help a doctor and his patient survive a haunted village, and then abruptly the world will change around him, and he’ll be trying to survive an onslaught of monsters in the basement of a hospital, all with no thought given to the doctor and patient that were just left in danger in the countryside. In this way, The Evil Within feels like a nightmare. A real nightmare. When I wake from dark dreams, for the fleeting moments I can remember them, I usually realize that they don’t have any form of sense. Nightmares and dreams are largely illogical, unstable, internally inconsistent experiences. The only reason they can feel the way they do is because the mind exists within them in a semi-conscious, semi-functioning state. When thought and reason are applied, they fall apart. Of course, I don’t necessarily think a desire to replicate the qualities of dreams was the intent behind the sloppy story of The Evil Within. I think they just had a lot of ideas they wanted to include in their game and gave no real thought toward creating more substantial connective tissue between them all. Nonetheless, The Evil Within is best appreciated when simply opening oneself up to raw, uncritical, moment-to-moment experience is prioritized over the need for overarching narrative to create a coherent world. The Evil Within, as a story, is utterly unsatisfying otherwise. The last stretch of the game does begin to try to satiate the player’s need to understand the events of the game, and for the most part, I understood the broad strokes of the plot. But there’s still so many things I don’t understand, and I don’t know if they’re just the result of plot holes, or if there are things that just went over my head. The game has three DLC chapters that perhaps shed more light (I have yet to play them), but I find it unfortunate that the main game really left me with more questions than answers. I have basically done a complete turn around on The Evil Within, and I’m glad that I gave it a second chance. It oozes style. It’s boss monsters are well designed terrors. It has a satisfying loop of stealth and action. It’s almost an encyclopedia of horror. However, everyone I’ve known who likes this game will immediately admit that it has numerous flaws and sharp corners. It’s incredibly ambitious, a creation that wasn’t designed to be restrained. This is precisely what makes the game special, as it wouldn’t have nearly the gravity if it wasn’t as expansive as it is. But at the same time, the game struggles under the weight of it all. It has a ton of weaknesses, and patience and perseverance is required to enjoy the totality of the experience. I’m glad I was able to finally get past all of these faults, but I don’t necessarily begrudge anyone who can’t. Should Resident Evil abandon zombies? Resident Evil has already had one rebirth after the lackluster Resident Evil 0, when Capcom took decisive action to mix up the standard formula and breathe new life into the weary series with Resident Evil 4. Two sequels and an unnumbered spinoff later, it feels like the series is on its last legs again in the wake of the abysmal Resident Evil 6. This time, though, with much of their visionary talent having defected from the company, I’m far less certain that Capcom can develop a cohesive plan for reinvigorating their old standby megaseller. Personally, I wouldn’t be too upset if Resident Evil just faded away. Some great games have come out of this series, many of which are still worthwhile today. I’m also much more confident now of the preservation of the horror genre going forward without it. Particularly amongst smaller developers, there seems to be renewed interest in delivering games in this arena, and the quality of these new efforts is definitely there. And if Resident Evil is to survive as a popular brand that people remain enthusiastic for, I think radical changes are once again needed, and these changes will need to be informed by the new trends in the genre that are occurring outside of Capcom’s doors. Unfortunately, my lack of faith originates precisely from Capcom’s ability to perceive the new environment in which it needs adapt. Although horror games are getting a bit of a new wind, “survival horror” in the vein of the classic Resident Evil or Silent Hill games is rather scarce. Those games were action games with a heavy emphasis on having to choose between offense or evasion. During a monster encounter, there was a calculation between fight or flight: can I successfully evade the enemies in this area and maneuver around them without getting hurt, or do I need to expend limited ammo to eliminate them as a threat? Modern horror games don’t really have this balance and instead gravitate toward one of the two extremes, being either heavily offense focused (e.g., Dead Space, Left 4 Dead, Evil Within) or heavily evasion focused (e.g., Amnesia, Outlast). In the action-focused offensive games, protagonists are well-armed and empowered, but the enemies they face are mercilessly aggressive monstrosities capable of applying extreme violence (or sometimes extreme numbers) to overpower their otherwise formidable prey. On the other hand, the evasion-focused titles are more like Clocktower than Resident Evil: there are only a few powerful monsters who the protagonist must stealthily outmaneuver or conceal themselves from, as they are incapable of responding to the threat in kind. 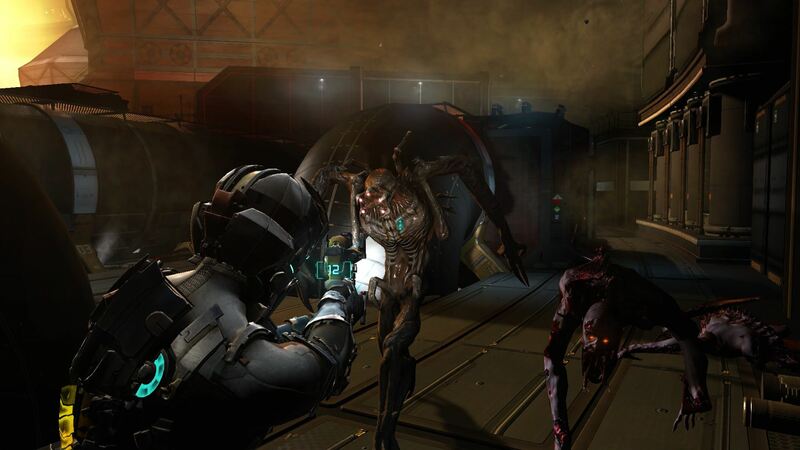 Dead Space 2: A good example of action-focused horror. Part of the reason the balance has disappeared is the result of advancing technology. The PSX Resident Evils had notorious “tank controls” that were a product of the PSX and Saturn controllers lacking analog sticks for smooth 360° movement. Consequently, sidestepping zombies and other monsters unscathed was not a simple trick, otherwise you would never need to consider attacking them. Similarly, aiming wasn’t particularly fluid as a result of the camera angles imposed by the pre-rendered backgrounds. Both control methods and graphics have improved since then, so these limitations would only appear in a game if they were self-imposed, and since gamers seem to be more frustrated by controls that deviate from accepted norms, developers rarely choose to implement old-school control schemes. So where does that leave Resident Evil? Resident Evil 4 already took it down the path of being amongst the action-focused games, and probably for good reason. Resident Evil always gave the impression of being influenced by B-tier action movies, and combined with the fact that most of the protagonists are law enforcement agents, it’s logical that it would eventually move farther down that route. I don’t see the alternative, of Leon Kennedy running away from the monsters to hide under the bed, as being fitting for RE. But still even with the action-focus, I feel that RE is lagging behind its counterparts in this area. My main problem with modern RE is that the enemies simply aren’t all that threatening. I felt Dead Space really exceled at making aggressive, dangerous monsters. When you hear a necromorph growling and snarling from down the hall, you know that it is coming straight for your throat, and when the creature is bearing down on Isaac, wildly firing at it won’t help. The player has to keep focus in the face of panic to strategically target limbs and appendages to neutralize the threat. For these reasons, the necromorphs maintain an ability to create tension and dread, even though Isaac is outfitted like a futuristic supersoldier. In contrast, the enemies from the last few REs have been relatively limp. Resident Evil 5 drove me crazy in this way. The monsters are definitely holding back in that game. For instance, majini would often charge at Chris and Sheva, only to stop short upon reaching them and sway back and forth for a few moments before making an attack. 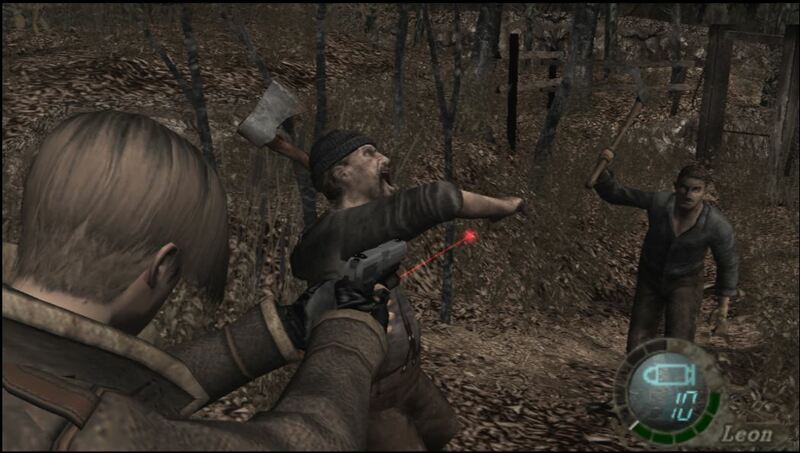 In reflection, even Resident Evil 4 had a similar problem with the Ganados. When you realize that these unnatural foes are playing with kid’s gloves, much of the tension disappears. So what is my proposal? This might be sacrilege to some, but I say get rid of the zombies. And not just the shambling classic zombies, but the more intelligent Ganado-type enemies as well. As I discussed above, these sluggish enemies just aren’t that hazardous when the player is using a modern control scheme which allows them to outmaneuver such slow opponents easily. I know some might groan at this suggestion, as zombies tend to be central to the identity of Resident Evil, but should they be? 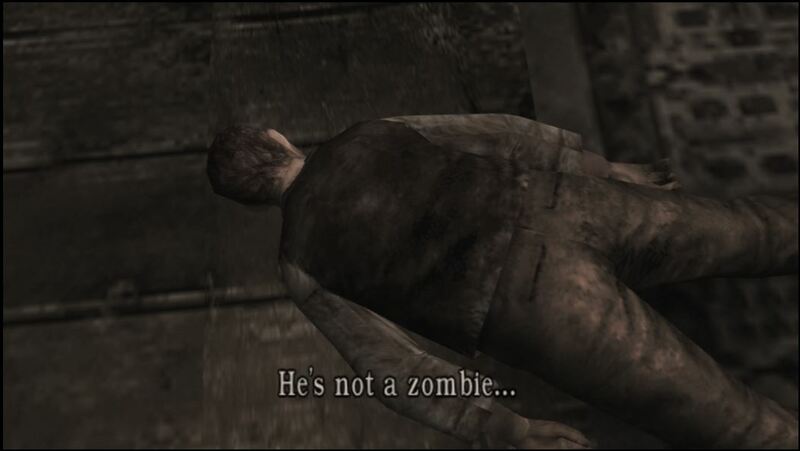 There are so many more monsters in Resident Evil that are much more interesting, such as regenerators, lickers, hunters, scarmigliones, verdugos, etc. These are what the next RE should be looking at when developing new creatures. And these new creatures should be brutal, like necromorphs, unrelenting in their belligerence, which is necessary to outmatch the well-armed and combat-seasoned protagonists we have in these games. They’ve already sort of made the move in this direction as RE:Revelations mostly nixed the zombie-style enemies in favor of more grotesque mutants. Some might complain that my plan might permanently take Resident Evil out of the “survival horror” milieu into what might be better categorized as “action horror.” My counterpoint would be that Resident Evil was never really a game about “survival” in the first place, and in modern gaming, that label is better reserved for games such as DayZ and State of Decay which are actually about survival in a zombie-ravaged world, not just ammo management.